Cogstone identified and gathered published and unpublished archaeological, anthropological, historical, folkloric, linguistic, and ethnographic primary and secondary resources in order to evaluate the eligibility of listing Hoon wit ten ca va (Garnet Hill) as a Traditional Cultural Property (TCP) in the National Register of Historic Places (NRHP). Also known as “Hills of the Roasted Bear”, extensive research showed that Hoon wit ten ca va was a sacred place that continues to play an important role in the maintenance of Cahuilla cultural identity and cultural practices. Although this study did not uncover any ethnographic information to explain the meaning of Hoon wit ten ca va, it did uncover a network of well-connected non-Native participants and political and social activists who worked on behalf of Native American communities across the country. In 1943, Francisco Patencio, a respected Cahuilla nẻt (ceremonial leader) from Palm Springs, recited stories out the first creations, the no cot em a book titled The Stories and Legends of the Palm Springs Indians “as told to Margaret Boynton”. According to Patencio, after Evon ga net marked the land and gave the different tribes a portion of the country upon which to live, Ca wis ke on ca, a head man of the Fox tribe, went around the country giving people and places names. One of those places was Hoon wit ten ca va “Hills of the Roasted Bear” known today as Garnet Hill(s) in English. Hoon wit ten ca va is associated with the Kauisik clan of the Cahuilla. The traditional territory of the Kauisik clan encompasses the City of Palm Springs and much of the surrounding area. One of the major research questions for this project was to find out how and why Francisco Patencio shared his stories with Margaret Boynton. When consulted regarding the location of potential Cahuilla ethnographic information, Dr. Lowell Bean, renowned Cahuilla scholar, stated that there was an additional collector of stories, Mabel Chilberg, who played an important role in recording the stories, almost ten years prior to Boynton. So, who was Mabel Chilberg, and how did she come to record stories from Francisco Patencio? The 1930 Azusa precinct US Census has Chilberg listed as a lodger in the Kate Vosburg, recorded as “Vosberge”, household .Chilberg was Vosburg’s personal assistant. Kate Slauson Vosburg was a local business woman and philanthropist in the greater Los Angeles area who opened a free clinic in Azusa, California in 1918. Chilberg and Vosburg were involved in the California Federation of Women’s Clubs (CFWC), in particular serving on its Indian Welfare Committee. 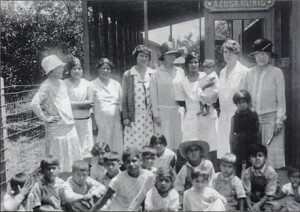 One of the missions of the IWCs was to use club influence to better the conditions of California Native Americans “through medical attention and welfare work,” with each club ministering to local Native American communities near their clubs attained food and clothing donations, support of education opportunities, and finding ways to rectify civil, economic, and social issues on the reservations. Vosburg anonymously contributed $20,000 to the CFWC Indian Welfare Committee in 1920, the first of many endowments made by her. It was probably through this contribution that Atwood first came into contact with Kate Vosberg and Mabel Chilberg. Since Atwood resided in Riverside, and her “home” women’s club was the Riverside Women’s Club, Atwood took to helping those tribes and reservations that were in vicinity, such as the Morongo Reservation, the Soboba Reservation, and the Agua Caliente Reservation (Atwood 1922). Atwood may have enlisted the help of Kate Vosburg’s assistant, Mabel Chilberg in working with those reservations. Chilberg may also have come into contact with Patencio through her relationship with Charles Lummis and the Southwest Museum. Charles Lummis founded the Southwest Museum in 1914 and was a member of the Southwest Archaeological Society, the organization that supported the Southwest Museum. Jonathon Slauson was the first president of the Southwest Archaeological Society and the father of Kate Vosburg, the woman who Chilberg worked for. This purposeful exhibit we expect to be the forerunner of legislation for the betterment of living conditions and social justic (sic) for our first Americans which in turn may help in shaping our future national-colonial policy. The exhibit was held during the CFWC’s annual conference in Los Angeles in May 1922 and was designed to “show the art and the humanity and the fineness of the Indians” to the clubwomen in attendance (Lummis 1921). The exhibit included items from the Southwest Museum’s collections, as well as other items from outside sources, and the items were mostly from the Southwest and Santa Catalina Island. In addition to his work with the Southwest Museum and Southwest Archaeological Society, Lummis was part of a group of male activists who fought for Native American rights. This group included Theodore Roosevelt, Francis Leupp, George Grinnell, and C. Hart Merriam (Hagan 1997). It is possible that Lummis put Chilberg (via Vosburg) into contact with C. Hart Merriam to provide letters of introduction for her to the Cahuilla community. Since Merriam had worked with Patencio in 1907 and 1910, he might have suggested him to Chilberg. Alternatively, Stella Atwood may have put Chilberg into contact with Merriam directly. Both Atwood and Merriam were part of the Advisory Council on Indian Affairs and thus had a working relationship (see Appendix B, Photo 7). Unfortunately there are no documents to support either of these theories. Excerpted from: Martinez, Desireé. Report and Evaluation of Hoon wit ten ca va “Hills of the Roasted Bear” as a Traditional Cultural Property. Prepared for Southern California Edison. Prepared by Cogstone Resource Management, 2013.